The DUP leader and First Minister Peter Robinson sparked widespread public outrage this week when he made derogatory comments about Muslims. He was speaking in defence of a north Belfast Pastor, who described Islam as “heathen” and “satanic”. The controversy comes as immigrant communities in the Six Counties are suffering increasing racist abuse and attacks at the hands of loyalists. Homes of immigrants including Muslims have been pelted, burned and daubed with messages such as “no blacks” and “locals only” by loyalist paramilitary elements, some of whom have links to British fascist organisations. Pastor James McConnell, prominent Belfast preacher with the Metropolitan Tabernacle, told his congregation last week that Islam had been “spawned in hell” and that Muslims could not be trusted. Defending the Pastor, Mr Robinson said he had attended the Pastor’s church and would continue to do so. Questioned on his comments, the First Minister said the preacher had applied a “broad stroke” when talking about Muslims, but that he too did not trust those Muslims who were “fully devoted to Sharia Law”. The DUP leader also said he would not trust a Muslim to provide spiritual guidance, but that he would “trust them to go down the shops for me”, and undertake other “day-to-day” tasks. The PSNI have said they are investigating a hate crime motive following the Pastor’s comments, but have made no comment on the First Minister’s remarks. There have also been calls for an investigation into whether the First Minister breached the rules of Stormont’s Code of Conduct for Ministers. 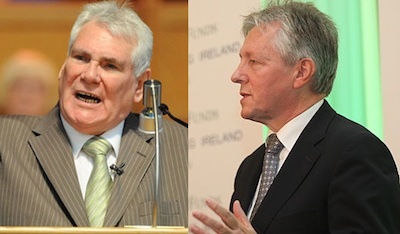 A meeting of the Stormont executive descended into angry exchanges on Thursday after Sinn Fein, the SDLP, Ulster Unionists and Alliance all criticised Mr Robinson and clashed with other DUP ministers, who defended their party leader. Sinn Fein’s Martin McGuinness said “such inflammatory comments only serve to fuel hatred”. In his statements, Mr Robinson insisted he would never “want to insult or cause distress” to the north’s Muslim population, but that he wouldn’t “take lectures from a self-confessed leader of a bloody terrorist organisation”, referring to Mr McGuinness. Eventually, a delegation of Muslim leaders said on Thursday it had received and accepted an apology “in private” from the First Minister. But in a statement, the DUP stopped short of saying Mr Robinson had apologised to the delegation, describing the meeting as “valuable, friendly and relaxed”. Alliance’s European Parliament candidates Anna Lo said she was ready to quit politics due to the controversy, which follows a cpmpaign of racist abuse directed at her by loyalists. She said she was angry at the backing given by Robinson to Pastor McConnell. The Hong Kong-born Assembly member dismissed Mr Robinson’s claim that his defence of Pastor McConnell has been “misinterpreted”. “I am so, so angry at what was said first by the pastor and then by the First Minister,” she said. Her comments drew a wave of support on social media, and an anti-racism rally is taking place at Belfast City Hall tomorrow, Saturday 31 May. Sinn Fein’s West Belfast MP Paul Maskey said his party was supporting the rally, which he said is an opportunity to “demonstrate solidarity with our minority communities”. “Ireland is now a multi-cultural society and everyone has a right to be treated with equality and respect,” he said. “And given the rise in racist attacks in the city and the deeply offensive remarks made about the Muslim community in recent days we must stand up together for these rights.